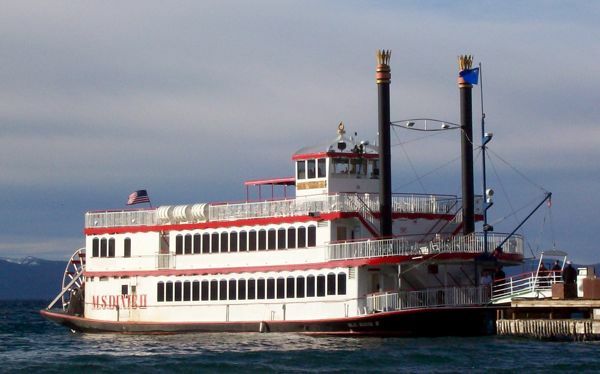 Join crew members aboard Nevada’s MS Dixie II or California’s Tahoe Queen as they battle to win lake superiority and race for the Tahoe Cup during the 22nd Annual Great Lake Tahoe Stern wheeler race. This 4 mile race can be enjoyed aboard either stern wheel. Choose your favorite and hop aboard to cheer on your captain as they churn their way along the southern eastern shorelines of South Lake Tahoe. 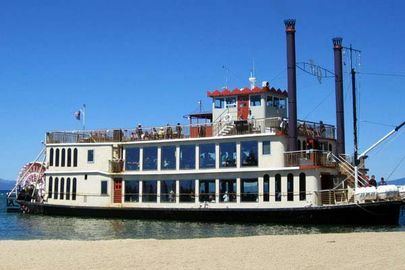 While the captains are racing for their chance to win the coveted Tahoe Cup, you will sit back, join in the party and enjoy Tahoe’s only paddlewheel brunch buffet featuring delectable offerings of Monte Cristo strata, summer vegetable frittata with goat cheese, cherrywood bacon, baked French toast and more. Book now, reservations must be made! Reservations can be made by calling 1-800-23-TAHOE. Check out the Zephyr Cove website for more information. RnR Vacation Rentals has another amazing property to offer vacationers and Tahoe goers. This new listing available for rent through RnR Vacation Rentals has everything a family could want. Immaculate custom built property with skill workmanship throughout. Marvelous design, beautiful inside and out. Enough room for your entire family to get lost or reconnect. This home designed for gracious Tahoe living with four large bedrooms, a huge living area, and loft for fun and games. Centrally located just one mile to Heavenly or El Dorado Beach. The entire family will love the location. Just past your private hot tub is the gateway to Bijou Park. Enjoy snow shoeing, cross country skiing, or just building a snow man in the winter. Or take in a relaxing walk during the summer or the challenge of disc golf or the skate park. Every activity Tahoe has to offer is just a walk, ride, or short drive away. This home designed for gracious Tahoe living. If you haven’t made up your mind about coming to South Lake Tahoe for Labor Day, let us help you make the decision. As we mentioned last week, there is a fantastic fireworks show that can be seen from almost anywhere on the lake! In addition to superior pyrotechnics, beautiful September allows for endless activities, indoor and out to fill your days this holiday weekend. Whatever your passion, we highly recommend checking out these 7 fantastic adventures South Lake Tahoe has to offer. Biking – South Lake Tahoe is home to some legendary mountain biking trails; in fact, award winning trails! (Don’t mind the humble brag). Daredevils unite and head to Tahoe for an epic day on some serious trails. Is road biking more your jam? Tahoe has some excellent rides for you as well! there is nothing like the breath taking views as you ride around the lake in a group or solo. Family Activities – Weather you’re a family full of adventurers or have young children, South Lake Tahoe is as family-friendly as it gets. From biking, beaching, to hiking your family will enjoy all that this lakeside town has to offer. Casinos & Gaming – Calling all thrill seekers, pokers faces, and gamers! South Lake Tahoe is home to multiple world class casinos and resorts. Take your kids to the various arcades or drop by the black jack tables, South Lake Tahoe is the place to get your game on. Golf – South Lake Tahoe has 6 public golf courses in the area. Aid golfers and beginners can all find something to suit their golfing needs, while hitting some balls in one of the most beautiful places on earth. Hiking & Running – From backpacking to a day trip picnic, the extensive network of trails in South Lake Tahoe will lead you to your ideal place. Paved roads and trail runs are plentiful with lots of space for runners and hikers alike. Nightlife – When the sun goes down and you’re not ready to end your day, South Lake Tahoe is up with you all night. From dive bars to nightclubs, South Lake Tahoe is ready to keep the party going all day, all way every day! Water Recreation – Finally, there’s the lake. Countless water activities will have you on the water all day long. Enjoy a ride on the MS Dixie, cruise in your speed boat, attempt to water ski or wake board, even try your hand at stand up paddle boarding. Whatever your favorite water activity is, you can do it here on Lake Tahoe! Inside and out, you will love this home. Completely remodeled kitchen with a large living area for the whole family to gather. Want Windows? How about four double sliding doors with views to the Lake, Heavenly, and the preserve across the marina channel. In winter you will love the unobstructed views of the mountains and lake. In the summer, you can greet your crew as he leave or return from the marina right out your backyard. This home provides very comfortable sleeping and dining for up to 6 people. The large downstairs living area is open from the kitchen, through the dining area, to the sunken fire pit and living room with play table and large flatscreen TV. Upstairs are three bedrooms and two full bathrooms. Open the curtains to over 15′ of windows and a private sitting deck. The second bedroom has a queen bed and the third has two twins. Your rental includes use of the boat slip in the Marina, parking for two cars, amenity passes for free use of the pools, tennis courts, and beach, and everything you need to have an enjoyable stay. Lake Tahoe always has something for everyone in terms of fun activities and luxurious lodging, and Labor Day weekend is no different. Just as exciting as any holiday on the beach, South Lake Tahoe has plenty to offer! 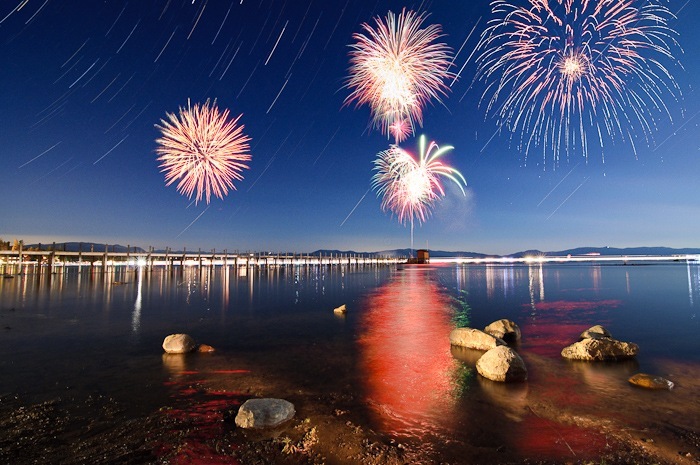 Any South Lake Tahoe location is perfect for watching the Labor Day weekend fireworks extravaganza. The area’s famous pyrotechnics will happen on Sunday, August 31st. The fireworks are set to a live music broadcast on KOWL AM 1490 and KLRT FM 93.9. The show starts at 8:30 pm and the exhibition can be seen from nearly any vantage point in town. Ahhhh, Lake Tahoe. A beautiful destination with stunning views and regularly gorgeous sunsets over the lake. No matter the time of year, Lake Tahoe is guaranteed to take your breath away. Rimmed with mountains, the sun sets at Tahoe long before it sets beyond the rim, this creates a lingering twilight and displays something magical in the night sky. Great for romantic occasions, dining with a view, photography, and so much more, the Lake Tahoe sunsets are a must see. Even on days filled with rain, Lake Tahoe Delivers pure beauty every night. Great for family of 4 and a family pet. This home is a great spot for relaxation, and to get away from it all. It has been beautifully remodeled with modern lighting, hard wood floors and ceilings, slate tiled gas fireplace, concrete kitchen counters and updated baths. The large partly shady/partly sunny deck is perfect for lounging or entertaining for a group. The home is located in the Meyers area, with easy access to the Pacific Rim trail for amazing day hikes–and 1.5 miles from the Corral Area Mountain Bike trails. The hustle-bustle of Stateline and the casinos are several miles away, providing the privacy and quiet you are looking for in South Lake Tahoe—but with easy access to night life when you want it. The upstairs master suite includes a queen bed beneath skylights, down comforter/duvet, and private bath that has been tastefully updated. This bedroom is completely private and can be shut off from the downstairs, to watch the 32″ HDTV (with DVD) or enjoy the sky view overhead. The downstairs bedroom has a king bed with down comforter/duvet, and futon sofa that can be used as a double bed. The downstairs bath has also been tastefully updated with beautiful wood ceiling, marble counter tops, modern fixtures, soft lighting, and new tile shower with massage jets and a heavy glass enclosure. Each bedroom includes quality bed linens, pillows and extra blankets. The bathrooms include towels, bath mat, hair dryer, bar soap and shampoo. The kitchen is super functional, with concrete countertops, hard wood floors, and new appliances. The kitchen has a small bar with 2 bar stools, modern lighting, and is open to the living room and dining room, for great conversation while preparing meals. The dining room table has seating for 6. It is stocked with enough place settings for 8, and all necessary cooking appliances and utensils. There are basic supplies such as spices and foil for your use. The living room is the perfect place to kick back on the comfy sofa in front of the fireplace and watch TV or movies. In addition to the sofa, there are 2 side chairs plus pillows for the hearth. The home has Wi-Fi, plus an A/V system that includes a 32′ HDTV, Charter digital cable and DVD player. There is an extra HDMI port for Roku, Apple TV, game systems and a 3.5mm input to connect iPods, iPhones or other mobile devices that you may travel with. This getaway includes a beautiful, large deck perfect for summer lounging, gathering with family and friends, and BBQing. The home includes a gas grill, large patio table with seating for 6 and two adirondack chairs. For evening entertainment indoors, there are 2 HDTVs, games and a game table in the upstairs bedroom. For the outdoor enthusiast, this home is in a great location, with easy access to hiking and mountain biking, river rafting and golf. The Tahoe to Yosemite Trail (TYT) and Pacific Crest Trails (PCT) are easily accessible from the home and are the main Tahoe trailheads for backpacking south to Mount Whitney. The South Upper Truckee Road Trailhead is located at the end of the South Upper Truckee Road in Meyers. It is a paved road to the trailhead and is maintained year-round. The unofficial hub of mountain bike activity in South Shore is just 1.5 miles out the back door. This area has a high density of trails for all ability levels, and will keep almost anyone interested for hours. For golfers, there are two golf courses within a short distance: Tahoe Paradise golf course is less than a mile from the home, and the Lake Tahoe Golf Course is 1.5 miles. In addition to close proximity to these outdoor activities, this home is about 1 mile to the nearest grocery store, shop, and several great restaurants for breakfast, lunch and dinner.